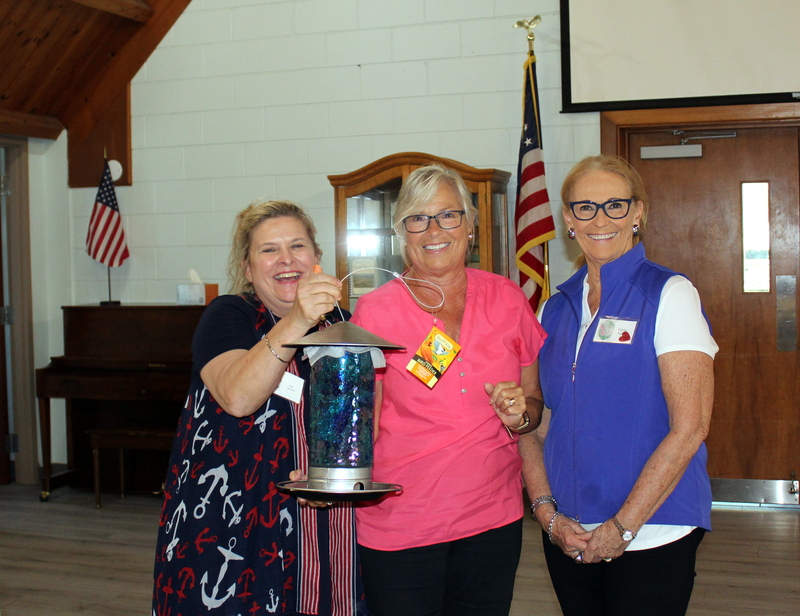 Eve Venters is presented with a bird feeder in appreciation of leading the program by Second Vice President Cecelia Weston and President Gayle Todd. For the last regular meeting of the year, the Holden Beach Beautification Club enjoyed a presentation by one of our own! Eve Venters led a hands-on fruit carving demonstration. Members who wished to, carved beautiful floral designs into watermelons at Eve’s direction. Eve was also the hostess for the meeting and showcased several carved melons, celery roses and vegetable roses along with a “palm tree” made of pineapples and palm fronds! During the business portion of the meeting, new officers were elected for next year. Linda Rast will serve as President, First Vice President will be Julia Anderson, Second Vice President will be Marlene Barz, Third Vice President will be Dolly Mitchell, Denise Mirandola will serve as Secretary and Donna Aycock will serve as Treasurer. Linda announced her other Board Members and Committee Chairs. Donna Blume and Carolyn Metrakos will co-chair the Art Committee, Jane Ivey will chair the Devotion and Sunshine Committee, Becky Greene will chair Landscaping, Kate Felmly and Marge Doyle will co-chair the Plant Sale, Seasonal Decorations will be chaired by Judy Bayless, Susan Gibble will cover Yard of the Month, Vicki Myers will chair Website and Publicity and Becky Willis will serve as the photographer. The May Social will be May 8th at noon at Dock House. Contact Janice Sullivan to RSVP at jvschaffer49@gmail.com.